A superb option for an exceptional, prestigious display and information point in public places, hotels, offices, hospitals, schools, colleges, showrooms and on exhibition stands. Touch screen version available. These screens will play video, stills and sound. They can be updated via the internet (using our unique CMS website) or by memory stick. The Freestanding Digital Poster has a built in HD media capability, allowing you to update it using a USB memory stick. Load your images and videos onto a USB memory stick, then insert it into the display, which will copy the files into its internal memory. Once you remove the memory stick the screen will then start playing the images and videos in a continuous loop. Or, you can control your network messages from your desk, anywhere in the world, via our CMS website for a small annual fee. 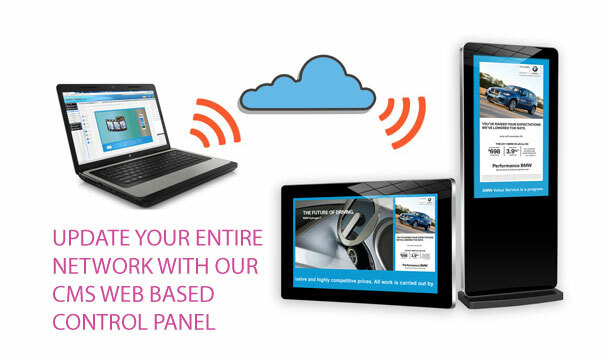 CMS - When you purchase a network screen we will take £100 off your first year's CMS fee so you just pay £50 plus VAT! The 50” Slimline Freestanding Digital Poster has a built in HD media player, allowing you to update it using a USB memory stick. Load your pictures and videos onto a USB Memory Stick then insert it into the display, which will copy the files into its internal memory. Once you remove the memory stick the screen will then start playing the pictures and videos in a continuous loop. or Update remotely via the internet! The portable 50” Slimline Freestanding Digital Posters are fitted with a commercial grade LCD panel and therefore have the ability to be in constant use, a wide viewing angle in both landscape and portrait modes, no buttons, controls, logos or branding on show and are generally much brighter than LCD panels found in home TVs. Their tempered glass face, rounded corners, super slim profile and aluminium surround all add to their captivating tablet-like aesthetics and also protect the internal components from potential damage. LCD-Plasma Screen Stand Up To 60"
Tilting LCD-Plasma Screen Stand Up To 100"